As consumers become increasingly more concerned with the environment and how to decrease their carbon footprint, we are already seeing a sharp rise in the number of households switching to a more environmentally friendly heating system. Installing a more efficient heating system certainly pays financially. A Stelrad heating system helps ensure that your heating system is working at optimum levels. With nearly 40% of all energy originating in buildings, it’s important to consider how you can decrease your carbon footprint. One of the easiest ways to do this is to invest in an extremely eco-friendly home heating system. Stelrad certainly delivers when it comes to environmentally friendly heating options. What makes Stelrad Radiators unique within the energy sector is their innovative technology whereby hot water can flow directly into the front element first, giving it a higher temperature. The Stelrad Radical radiator is the definition of eco-friendly. Thanks to their unique heating technology, your radiators could heat up up to 23% faster. Plus, the system is able to produce up to 50% more radiant heat. This will easily enhance your feeling of comfort. Also, as a result of increased radiant temperatures at the front of your Stelrad Radiator, the rear-element will be less warm than with other radiator models. The rear panel of the Stelrad Radical radiator will not heat up as much as a standard radiator model, which means less radiant heat is lost through the wall. This means you can enjoy a reduction of up to 8.8% in energy loss as a result of Stelrad technology. Size: There are three different heights to choose from in the Radical Radiator series. The largest option is 600mm. You also have a good selection of radiator lengths ranging up to 2000mm. Panel Style: You can opt for either a single panel style or a double panel, depending on your preferences. Integrated TRV: There is no need to purchase thermostatic radiator valves separately. This is because every Stelrad radiator is fitted with thermostatic radiator valves that work on both the left and right side of your new radiator. What Does This Mean for Your Energy Bills? 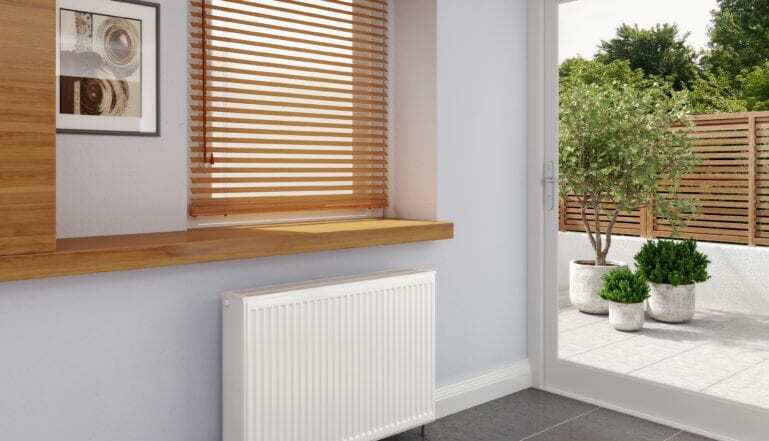 The Stelrad Radical radiator is a serial feed radiator. This eco-friendly heating option is still a relatively new option on the UK heating market. However, its popularity levels are rapidly rising. Altogether, installing a Stelrad Radical radiator system will help to increase your feeling of comfort, as well as reduce your heating bills. In fact, Stelrad customers can expect to see a saving of up to 10.5%. Alongside saving money, you will also see a marked improvement in the efficiency of your heating system and a reduction in CO2 emissions.